Are you an exhibition enthusiast? 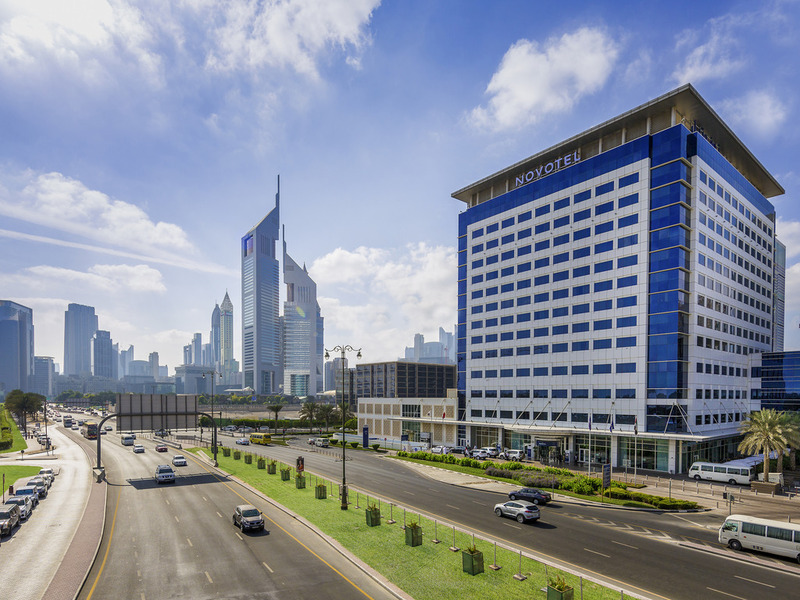 Enjoy direct access to the Dubai World Trade Center where all major events take place all year round. Experience a comfortable stay after a long day and relax with the sound of live jazzy tunes at the Blue Bar. Spacious, contemporary design and adaptable, the Novotel room is truly a place for living. Perfect for all your needs. 412 newly refurbished rooms are tastefully decorated and fully equipped with the highest quality amenities to offer guests a memorable stay. Opt for the Suite for the spacious living area guaranteed to offer the luxury and comfort for your stay. Café Cream is a stylish coffee shop, the perfect place for meeting people, socializing, and enjoying a wide selection of teas, coffees, refreshing mocktails, and complemented by sweet & savory temptations. Entre Nous Restaurant offers an all-day dining experience in a unique open space located adjacent to the hotel lobby. With lofty ceilings and light airy spaces and views onto the pool, you really can escape from your busy day whilst dining here. The original and only true Jazz and Blues venue in town, Blue Bar offers a relaxed and informal atmosphere whilst soaking in the soulful tracks nightly and live performances every weekend. Enjoy selection of beers, wines, cocktails and snack menu. Nice hotel with the best receptionists. My experience in general is positive due to the fact that the employees who were working there are very friendly and cooperative. A very pleasant stay as usual. From being greeted on my arrival by the great big smiling, Mr Remmy, to my warm greetings in the Blue Bar by Ganesh, Sunkar, Rudolfo, Joe and the ever smiling Frances, I always feel most welcome. They all make an effort to ensure my comfort for a pleasant stay. Also a mention and expression of thanks to the Nepalese gentleman who kept my room tidy and a constant supply of water. Also thanks to the front desk staff and also the morning crew in the dining room. The room were clean, the staff are super friendly, just 1 issue, the valet takes some times up to 20-25 min to bring up the car. Other than that it was perfect. Room service response is very quick and all staff were polite. The stay was comfortable. The only disturbing thing is during the breakfast time. In the morning you need some peace. The people serving you often get behind you to give a review on Trip Advisor or some other site. They even volunteer you to show you on the mobile how to fill it up. Now that very very irritating. Morning time you want some time for yourself and not to get too much bothered. It also happens that when you politely convey that you will write a review or rate them later, then somehow they vanish and do not even come and ask do you need something or coffee. If the serving people are so interested to tell the customers to write a review, can you install a small kiosk where people can write reviews. As expected coming from Novotel and Accor.but for the price you may wonder why we need ask for a tooth brush.alll staff was very friendly and helpful.i wld recommend the novotel also very close to te WTC. Couldn't be better placed for visiting trade shows taking place at the World Trade Centre and the amenities located in the general vicinity. The hotel had everything expected from a modern brand and the room was spacious and comfortable. Staff all very welcoming and helpful.